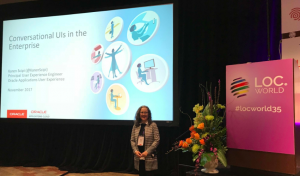 Oracle Applications User Experience (OAUX) team member (and Microsoft Alum) Karen Scipi (@karenscipi) presented on the subject of Conversational UI in the Enterprise at #LocWorld35 Silicon Valley. Karen covered the central importance of language design for chatbots and other conversational user interfaces (CUIs) for global work use cases. Karen even developed two chatbot integrations for Slack introducing her topic. One was in English, the other was in Italian. CUI means we moved from a “user”-centric concept of design to a human-centric one. After all, what could be more “natural” that talking to a computer? Both humans and computers “converse” in dialog, and it’s the language design knowledge for such a conversation that’s critical to delivering a natural, human-like interaction between the two. Examples of CUIs include Facebook Messenger, Slack bots, Telegram, Amazon Echo and Alexa devices, and so on. Interaction can be via voice, SMS messaging, typing text on a keyboard, and so on. In the enterprise there are a broad range of considerations and stakeholders that localization and UX pros must to consider. Fundamentally though, enterprise CUIs are about increasing participation in the user experience of work, making things simpler. To an extent, the localization or language part of the CUI interaction is determined by the NLP support of the chatbot or other platform used: what languages it supports, how good the AI and ML parts are, and so on. However, language skills are at the heart of the conversational UI design, whether it’s composing that user storyline for design flows or creating the prompts and messages seen by the human involved. This kind of communication skill is much in-demand: It is a special type of talent: a mix of technical writing, film script or creative writing, transcreation, and interpreting. It’s a domain insight that gets right down to the nitty-gritty of replicating and handling how humans really speak and write: slang, errors, typos, warts and all. CUI language designers must even decide how emoji and personality can or should be localized in different versions of a chatbot. The conversational UI market is growing globally as messenger apps take over. 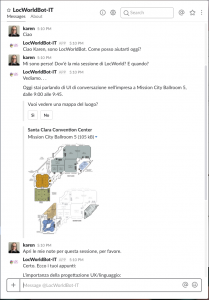 Localization and language pros cannot ignore the conversational UI space.